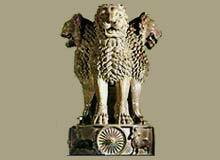 The National Emblem of India has been taken from the Sarnath Lion capital erected by Ashoka. The national emblem of India was adapted by the Government of India on 26th January1950. In the National emblem only three lions are visible and the fourth one is hidden from the view. All the lions are mounted on an abacus. At the centre of the Abacus, there is a Chakra (wheel) which symbolizes the Dharma Chakra (Eternal wheel of law). There is a bull, a galloping horse, an elephant and a lion, separated by intervening wheels over a bell shaped lotus. The word Satyameva Jayate (truth alone triumphs) have been inscribed in Devanagari script. The National emblem of India is the official seal of the President of India and Central and State Governments. The National emblem is used only for official purposes and commands highest respect and loyalty. 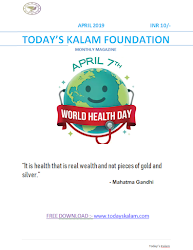 It is also a symbol of independent India's identity and sovereignty.